Chenin blanc has been at the core of the Cape wine revolution since 1994. No other grape can offer three crucial aspects of that revolution: 1) being integral to local tradition; 2) being intimately connected to terroir – partly via old vineyards; and 3) being a good quality grape comparatively cheaply available to exploring young winemakers without land of their own. If it weren’t for the Swartland’s treasurehouse of largely neglected, unrespected chenin blanc, could that region have come to occupy the unique place it so firmly has in the modern Cape? It’s not easy to think of a smart young(ish) avant garde producer without at least one fine chenin and/or chenin-based white blend in his or her portfolio. Still the Cape’s most planted grape (though its predominance greatly diminished), chenin continues to play a central role in the co-op system that so dangerously dominates South African wine production, giving grapes for distillation and for cheap white wines, and the occasional more ambitious version (with the Breedekloof Makers focus on chenin an important initiative). At the other end of the market, chenin is surely responsible, or partly responsible, for a large proportion of top-end-expensive whites, leaving chardonnay and Bordeaux-style blends somewhere behind. Think Sadie, Alheit, David & Nadia, and Raats just for starters, while the number of chenins retailing for over R300, let alone over R200, is notable. Whether they’ll all survive in what is getting to be a crowded market is another matter. The priciest of them all was probably the Dirty Little Secret 2015 from Ken Forrester (one of the great pioneers of ambitious Cape chenin), which must count as something of a flop: as far as I know there hasn’t been another vintage released, and I see the original still available three years later at a Cape Town shop for R1169. After well more than a decade, however, Sadie’s Mev Kirsten still sells each year at over R800 locally and three times that in some foreign markets. If I were pushed at a steakhouse or wherever to buy a wine off a cheap and boring winelist, I’d look for a co-op chenin, fairly confident that it would be drinkable at least. But if one aims higher in finding a bottle to buy, does one need to go at least close to R200 or is there anything under R100 that offers the interest, the commitment to terroir, the careful vinification, and generally the quality to appeal to the non-rich but fussy drinker? Secateurs from Badenhorst has done extraordinarily well doing something approaching that. I went to Pick n Pay hoping to find a few others. I wanted chenins below R100 that declared an origin more specific than “Western Cape” or “Coastal Region”, but there were precious few. I went for Porcupine Ridge from the Swartland and Kaapzicht from Stellenbosch, but then settled for a well-known Western Cape blend, Ken Forrester Petit. All 2018, all under screwcap – a closure that would be hard to find at higher price levels, I think. In fact I hadn’t realised till I checked my till-slip at home just how inexpensive the Porcupine Ridge was – R45 (I see it at Cybercellar for R54 and as “on promotion” at Makro for R44, down from R49). It is really excellent value, with some ripe fruity charm (pear, stonefruit etc) but not trivial or dumbed down, a firm and fairly well integrated acidic presence. Easy to accept this as a modest Swartland wine. What it most lacks, of course, is the intensity and character you might well expect when you’re paying a great deal more. The easygoing Petit Chenin at R60 (R55 at Makro) is a little more acidic and thin, a little less characterful, but pleasant enough. Kaapzicht is, at R90, double the cost of Porcupine Ridge. Attractively classic packaging, and status as a Stellenbosch estate wine (presumably made in much smaller volumes than these other two), help to justify that. It’s a very decent wine, deliciously fresh and with a greenish bite that I rather like (it declares just 12.5% alcohol), and more intensity than Porcupine. But at this price it might be worth vaulting over the R100 hurdle, where there is waiting for you, amongst others, another Ken Forrester wine, the Old Vine Reserve at about R110, which perhaps offers as much value for money at this higher level as Porcupine Ridge does at the lower. 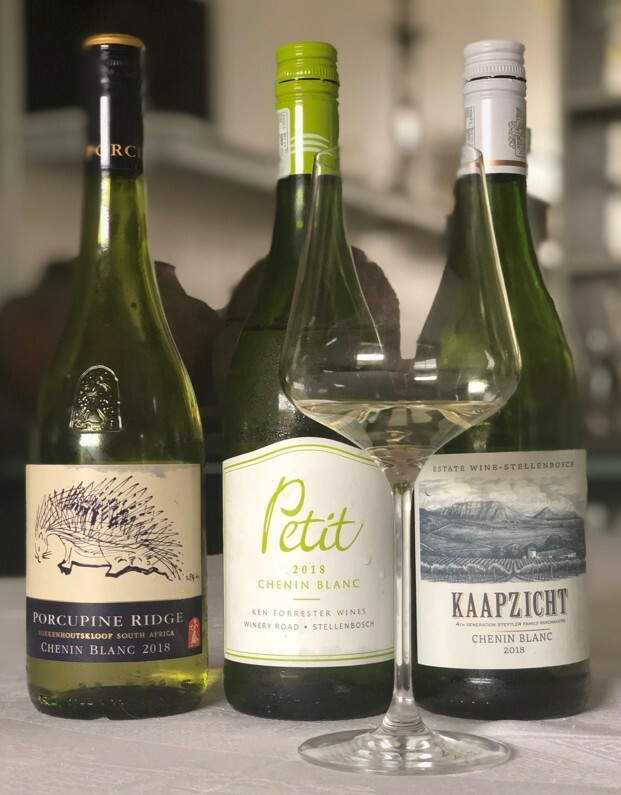 Overall, the extreme spread of prices for chenin (Porcupine Ridge is far from the cheapest available) from a few tens of rands to many hundreds, means that it’s worth exploring the market. There are opportunists aplenty: not all the wines, at all of those levels, are quite worth the money; but many are and – again at all levels – Cape chenin offers unmatchable value that should be the envy of the wine-producing world. Here we go again. Are there no other products to review but those of your master Kent. @Clark Chenin is a noteworthy topic and Porcupine Ridge has been extremely successful. If you disagree on Tim’s opinion of the Porcupine Ridge say something but otherwise it is a sensible inclusion in this piece. Personally, the Marras 2017 Chenins over-deliver hugely and my liver regrets their discovery! @Kevin i don’t think Porcupine ridge is a better than many others at that price level. I see continuous bias, i have to call it out. Mulderbosch Steen op Hout and Secateurs have to be the best 2 Chenin buys in the sub R100 category surely? Beaumont is also very good too. I’ve tasted wines that are R50-80 more than these that are not as good. And if you hunt around there are Chenins from less fashionable/new producers – Exdiem in Robertson make a bush vine single vineyard Chenin that sells for R65 being just one example. Rijk’s Touch of Oak has to be the best Chenin you can buy for under a R100 (@ Makro). Pick n Pay’s wine prices for me are more expensive that other retailers as is the case when paying R90 for a bottle of Kaapzicht Chenin Blanc. The (very delicious) Mulderbosch chenin has to be the best value wine in SA. For me a chenin that’s always punched above its price is the Leeuwenkuil. Sells for about R50. And Stellenrust does a cheapie as well – around R70. Great wines. have to agree the steen op hout is fantastic I also like the secateurs. lately the marras has become a favourite. I find the petit chenin insipid. I quite enjoyed the Saxenburg Guinea Fowl White (100% Chenin) recently, fruity, moderate acidity and rather drinkable, for a very reasonable R75 on Cybercellar. I’m largely with Hennie C ref Leuwenkuil and Stellenrust, although the 2018 of the latter is not quite up to previous standards, IMHO. Another interesting option is the Survivor Chenin from Overhex – again, not fashionable, nor cheap at R120 ex cellar, but a very fine Swartlands-sourced tipple that is great VFM. The regular Chenins from both Windmeul and Perdeberg are wonderful value under R50 per bottle. Their reserve wines are even better and also great value under R100. Secateurs from AA Badenhorst never disappoints. And for a while the wonderful Kloof Street Chenin from Mullineux was under R100, but I believe it’s over that price now (probably rightly so). Besides the old faithful champion Secateurs, my vote also goes for the Exdiem from Robertson made by Lourens Van Der Westhuizen if I am not mistaken. Massive value. They also do a bone dry chenin/muscat blend which makes for compelling drinking. Is Porcupine Ridge not out of the stable of Boekenhouts Kloof; based in Franschhoek?